Deputy Prime Minister Hoang Trung Hai chaired an urgent meeting on July 16 to instruct ministries, agencies and localities to prepare for super typhonn Conson as it suddenly changed its course southward and is now heading for the northern delta, instead of towards the Vietnam-China border as was previously forecast. Deputy PM Hai warned this is a powerful storm, which has caused huge losses of human life and property in the Philippines. There is no room for complacency, as the storm is forecast to directly hit coastal areas from Quang Ninh to Thanh Hoa provinces, which accommodate many fishermen, he said. He asked these provinces to ban vessels from setting sail in case of emergency. He also asked the National Steering Committee for Flood and Storm Control and the Ministry of Agriculture and Rural Development to dispatch inspection teams to areas vulnerable to floods. On the same day, Prime Minister Nguyen Tan Dung also sent an urgent message to ask localities that are in the storm’s path to prepare for its arrival. The message says the PM instructs officials in coastal provinces and cities from Quang Ninh to Quang Tri to prevent vessels from going out to sea if necessary. Evacuation and any other procedures that will guarantee the safety of people, and infrastructure are also required. According to the National Hydro Meteorological Forecasting Center, with the current moving direction and rapid speed, the storm, the first of the season, is traveling to the Red River Delta. In which province the storm center will make landfall has yet to be determined, but northern coastal provinces from Quang Ninh to Thanh Hoa will be affected severely. At the meeting, the center’s director Bui Minh Tang said the storm is heading for the Gulf of Tonkin with sustained winds of 125kph near its center. Conson has been forecast to enter the gulf the morning of July 17, striking the northern coastal area by afternoon. The storm will be off the coast from northern Hai Phong to central Nghe An Province today. He said the strongest winds near the storm center would peak at 89-117 kilometers an hour with gusts topping 118-149 kilometers per hour. 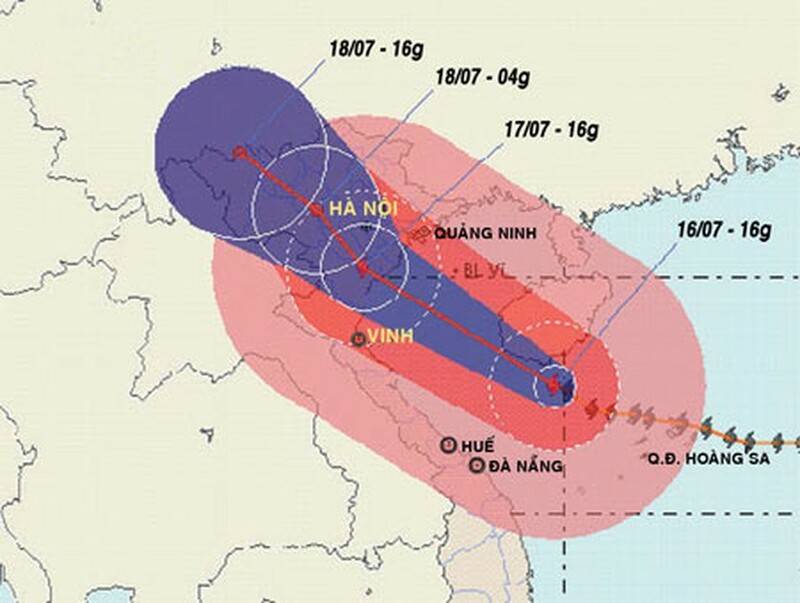 Strong winds and heavy rains are likely in coastal provinces from Quang Ninh to Thanh Hoa and northern provinces, including Bac Ninh and Hoa Binh, as well as in Hanoi. Forecasters predict the storm will generate waves of between 6-8 meters and tides of between 2-4 meters. 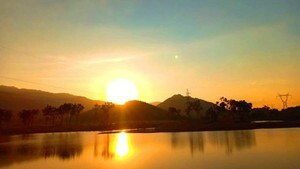 Mr. Tang said the storm is expected to weaken into a tropical low-pressure system by the morning of July 18, when it moves through areas from northwestern provinces of Son La to Lai Chau. Hai Phong, Hai Duong, Hung Yen, Hanoi, Bac Ninh, Bac Giang and Hoa Binh may be struck by the storm center or merely affected by heavy floods. Mr. Tang warned that northern provinces would have high rainfall of between 100-200mm, even 400mm in Hoa Binh and Thanh Hoa provinces. The afternoon of July 16, residents in northern Nam Dinh Province and Hanoi rushed to buy dry provisions to store for the storm and possible floods. Authorities of coastal districts of Nghia Hung and Giao Thuy in Nam Dinh Province called sea bound clam breeders to return to shore. The province has prepared evacuation plans for 3,400 residents in the two districts. Le Han Hien, deputy head of Hai Phong’s Steering Committee for Flood and Storm Prevention and Control, said 12,000 fishing boats have been anchored at Cat Ba Port, Cat Hai Island and Do Son peninsula to avoid the storm. The People’s Committee of Hai Phong’s Cat Hai District, together with 100 soldiers, helped thousands of residents living in coastal villages evacuate the afternoon of July 16. According to central Quang Tri Province’s Steering Committee for Flood and Storm Prevention, until afternoon of July 16, about 800 boats returned to shore or were in safe anchorage areas. Northern Quang Ninh Province also called over 10,000 boats ashore. Over 3,000 boats in Quang Binh Province returned from sea, while 500 boats with about 3,000 fishermen are on their way back to the shore. As of the afternoon of July 16, 443 fishermen aboard 43 boats from Da Nang Province were still at sea, with one boat and 27 fishermen working in the Truong Sa (Spratly). In central Quang Ngai Province, 6 boats with 78 fishermen that had been in accidents in the Hoang Sa (Paracel) Archipelago were towed to the shore. The Border Guard High Command reported that it has been unable to contact 237 fishermen aboard 17 ships from the province working in the Hoang Sa Archipelago. At least six vessels have been reported sunk and another five ones are missing. Border guards in coastal provinces have fired signals at 28 fixed and 15 mobile points to warn ships operating offshore. Due to the storm, national flag carrier Vietnam Airlines has announced the cancellation of four domestic flights on July 17.